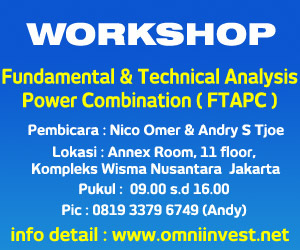 Nico Omer » Apakah Waktunya Ambil Untung? Home > Pasar Internasional	> Apakah Waktunya Ambil Untung? Sejak tahun 2009, bursa saham Wall Street seperti mengalami tren kenaikan yang tak terbendung. Namun di akhir pekan lalu, indeks Dow Jones terkoreksi dalam 5 hari berturut-turut untuk pertama kalinya sejak Mei 2012, Nasdaq mengalami tekanan mingguan terbesarnya dalam 9 bulan, sementara indeks S&P kembali masuk ke zona merah (negatif) untuk 2014 berjalan ini. Jadi pertanyaan kunci yang ada di benak para investor adalah apakah ini akan menjadi akhir dari bull cycle yang dimulai sejak Maret 2009 (berusia 5 tahun saat ini). Terutama belakangan ini yang menarik diperhatikan adalah kenaikan Nasdaq 100 hingga 83% (31 Desember) dan 82% (26 Februari), yang adalah rekor terbesar kenaikannya, namun ini berarti bahwa ke depannya akan dibayangi kepanikan dan penurunan tajam. Grafik di atas menunjukkan bahwa sentimen bearish bursa saham anjlok ke level terendah sejak 1987 (yang tidak terlihat di grafik tersebut). Oleh karena itu, penurunan Dow Jones pekan lalu dapat dikhawatirkan sebagai awal dari tekanan jual. Bisa saja bursa akan naik lagi, namun sudah muncul indikasi penurunan lebih dalam dan selloff berkelanjutan. 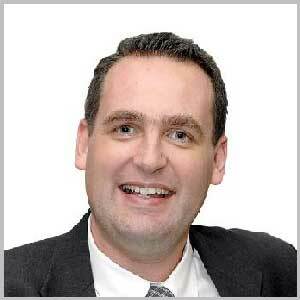 Robert R. Prechter, Jr. dari Elliott Wave International’s juga memberikan perspektifnya mengenai seberapa jauh kenaikan pasar akan terjadi dalam sentimen investor sejak krisis AS 5 tahun lalu. In the back-to-back weeks of December 4 and 11, Investors Intelligence reported that only 14.3% of stock market advisory services are bearish. This is the lowest percentage in over a quarter-century. It is lower than at the highs of 2000 and 2007. The last time numbers were lower was before the 1987 crash. The idea that the stock market will end its rally with a near-vertical advance is appearing in articles, interviews, newsletters, web posts, and even emails to EWI. It is especially popular among super-bears who have long recognized that the market is in a bubble. The problem with this idea is that the Dow and S&P have never blown off. The stock market as a whole has never accelerated upward at a market top. It often accelerates off bottoms, and it always accelerates in the center of a third wave; but it has always lost momentum in a fifth wave relative to the third wave. Predictions for a blow-off defy history. Commodities are the exception, as Frost and I pointed out in 1978 in Elliott Wave Principle (see text, p.173). In fifth waves of Primary and higher degree, commodities often accelerate upward before reversing. Recent examples include oil in 2008 and silver in 2011. The reason for the difference is that commodities peak on fear, whereas stocks peak on complacency. Some people are arguing that the stock market has become “commoditized,” and that’s why it’s about to go into a parabolic rise. While we cannot say such an event is outright impossible, it’s never happened. One thing that does happen repeatedly in the stock market is for investors to raise their upside forecasts dramatically at a top. In 1999-2000, at the market’s true peak, books came out calling for Dow 36,000, Dow 40,000 and Dow 100,000. Today’s calls for a melt-up, then, are probably just capitulation to the bullish imperative, a rationalization of optimism. By this means, bears have switched from predicting a collapse to predicting soaring prices. In other words, “Sure, it’s a bubble; but it’s not topping now. In fact, it’s going to start going up faster!” These melt-up predictions are yet another indication that the market is close to a peak in the biggest B wave in recorded history. This type of capitulation to the trend is different from panic, because it occurs at the opposite end of the psychological spectrum. There is no single word for it. Some people say things such as, “Investors are going to panic into stocks.” But the only people who can buy in panic are those who are short, and they typically constitute a very small percentage of investors. The stock market as a whole does not panic up. But it does occasionally experience a sudden crystallization of optimism. Usually it happens without much near-term price movement; it is the result of a long period of past price movement. We might call this event a cynap, the opposite of panic. When investors’ synapses snap, their opinions become aligned like particles in a magnet. That’s what we have today. Meanwhile, the stock market has been losing upside momentum for seven months. This is how market tops have always formed, not with a rocket blast but with a subtly slowing ascent. Even in 1929 the market did not blow off; the rise that year was slower than the market’s rise in the second half of 1928. Is this time different? Well, so far it’s exactly the same in that people are saying it will be different. One or two bears agree with us in being more vocal than ever about the risk in today’s market. Jean-Pierre Louvet of the SafeWealth Group reports on US insolvency, bank woes, deflation, and what “cash” means: David Stockman knows it’s a bubble and pulls no punches in saying how it will end. The Daily Sentiment Index (trade-futures.com) reported 93% bulls twice, on November 15 and 22. Two readings this high are a rarity. The weekly Investors Intelligence poll on December 11 and 18 showed over 80% bulls among committed advisors (i.e., bulls/(bulls+bears), omitting those expecting a correction), the highest reading since 1987. Such extreme readings in conjunction are even rarer. The Rydex family-of-funds data afford good sentiment indicators. Recent figures show a record low investment in conservative money-market funds, meaning nearly everyone is invested in stocks and bonds. 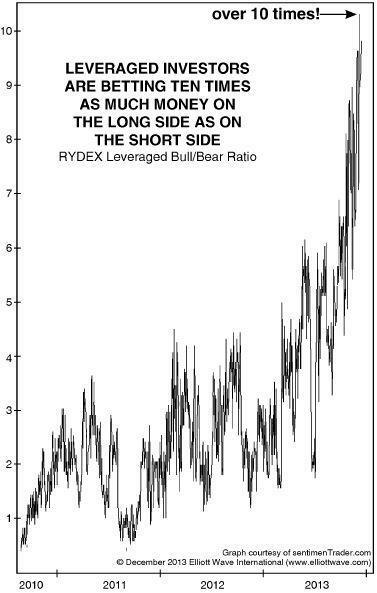 At the same time, the ratio of money in bullish stock funds vs. bearish stock funds is over 5:1, and per SentimenTrader.com the ratio of money in leveraged bull vs. bear funds (see below) is 10:1! This reading leaves past extremes in the dust. If you study the chart, you will notice that the biggest rush has come in the past six months, which is precisely the time that stocks’ ascent has been slowing! In other words, optimism is soaring while upside momentum is waning. Once this epic complacency melts, I doubt we will see such a ratio again in our lifetimes. 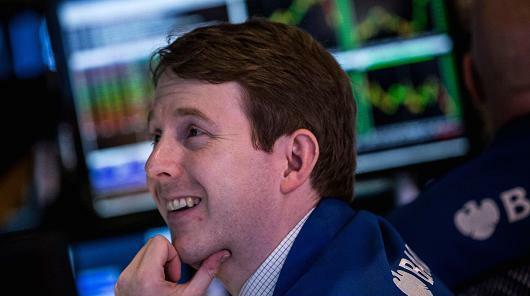 Investors must display wild-eyed euphoria before the market can turn down. The weak recovery is keeping investors from being bullish enough for a top. If the market corrects, it will be a blessing. But don’t wait for a correction, because you’ll just miss the boat. because the economy is getting healthier and will soon be in a stronger expansion. …but if they do, it won’t hurt the market. We have lots of sector picks and stock picks. Can you imagine advisors showing this much confidence and unanimity at a truly good buying opportunity? In March 2009, the Daily Sentiment Index (trade-futures.com) recorded an all-time low of 2% bulls, meaning that 98% of S&P traders thought the market would go lower. 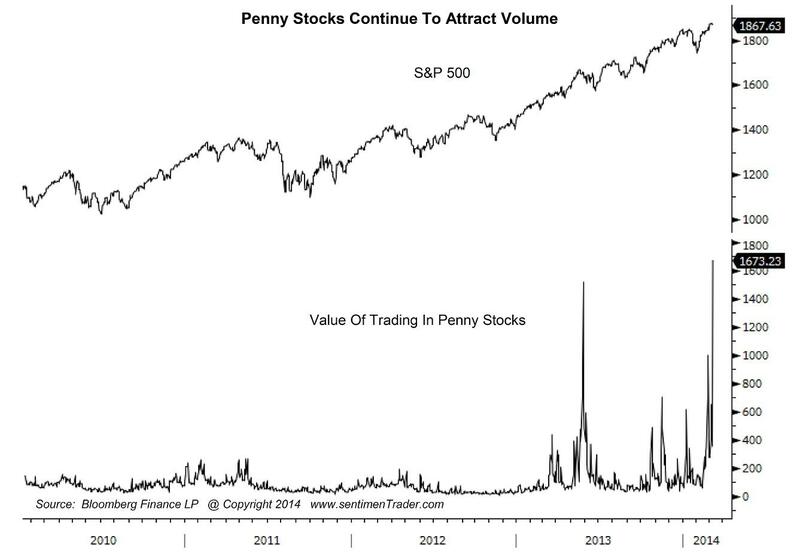 Money managers who are bullish today will tell you that March 2009 was an “obvious” buying opportunity. But most of them never got out at the previous top so they could put cash to work, and when the time arrived they were cautious, if not scared stiff. Now they are devoid of fear. They won’t raise cash at this top, either. We don’t know if the S&P will go up another 100 points before it reverses. But one thing we can count on is that all of the sentiment extremes we have observed will lead to their opposite. “While central bankers, asset-gatherers, and TV ‘personalities’ remain nonchalant of stocks being in a bubble, some are positively vociferous over the manipulated mania US investors are currently re-experiencing. 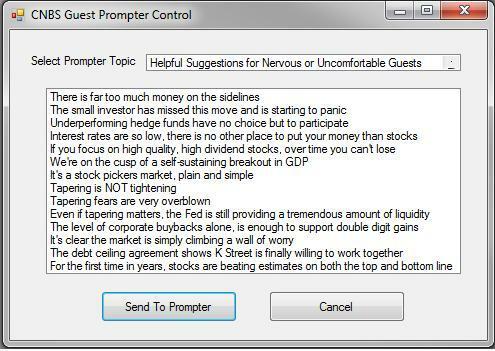 Sentimentrader has posted a few updates recently that show that financial froth is quite out of bounds by now. 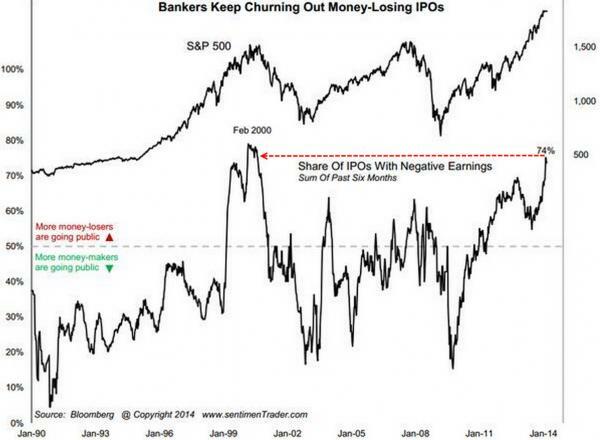 For instance, the share of IPOs of money losing companies over the past six months has soared back to the highs last seen at the top of the technology mania in 2000. A full 74% of all IPOs issued over the past half year were in companies that are making losses. The securities of such companies bereft of income of course all tend to soar right after they hit the market. Admittedly, a similar spike in 2013 subsided quickly and didn’t turn out to mean anything, but since then there have been several intermittent spikes, and their frequency has clearly increased. At some point it will mean something (just because something has not had meant much so far does not mean it never will). 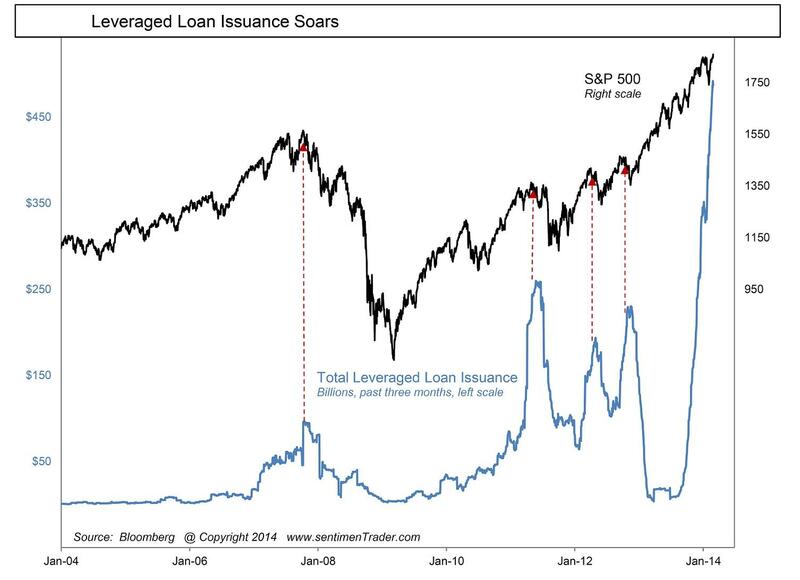 However, the soaring issuance of leveraged loans really takes the cake. This is a chart to make even hardened bubble-heads dizzy. It is especially noteworthy how the current surge compares to the surge in 2007, shortly before the last bubble peaked. Nothing remotely comparable has ever been seen before. It is a mirror image of record junk bond issuance and the mania for high yielding debt in general (whereby ‘high yielding’ these days actually means ‘not yielding very much’). So we ask again: Is it a bubble yet? Perhaps Ms. Yellen knows. Another indicator that is worth examining is the amount of cash held by mutual funds relative to their assets. As a ‘signal’ it has not been very useful for quite some time now, but it nevertheless tells us something about the sentiment of fund managers. 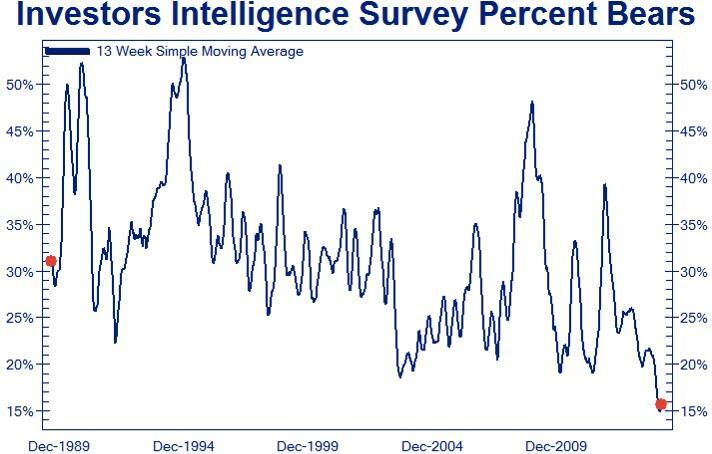 As a long term chart reveals, the previous secular bull market was undergirded by a great deal of skepticism on the part of this group, and it ended when its skepticism vanished into thin air in late 1999/early 2000. What do these luminaries currently think? They are at their most bullish in all of history, and as fully invested as they can possibly be. 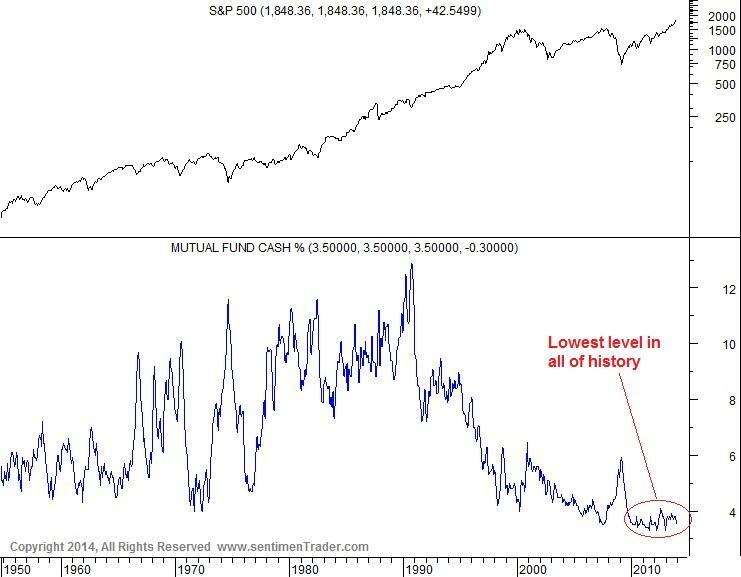 Mutual fund cash – fund managers were deeply pessimistic in the first decade of the last secular bull market, and when their pessimism gradually unwound in the 1990s, the bull market went into overdrive and became the biggest bubble in terms of valuations ever seen. Right now this group harbors exactly zero skepticism and is invested up to its eyebrows. Finally, one can also examine margin debt, which shows us the extent to which investors are prepared to speculate with borrowed money. It is well known that margin debt currently stands at a record high, but below we show a chart from Doug Short that gives us a close-up of the investor net credit situation at the NYSE, which is at its most deeply negative level in history. Apart from the fact that the entire ‘cash on the sidelines’ argument is extremely flawed on a fundamental level, it is in our opinion quite dubious for a market expert to invoke this myth in view of such data points. This is not the picture of ‘fuel for a bull market in its middle innings’, it is rather a warning sign with an exclamation point. 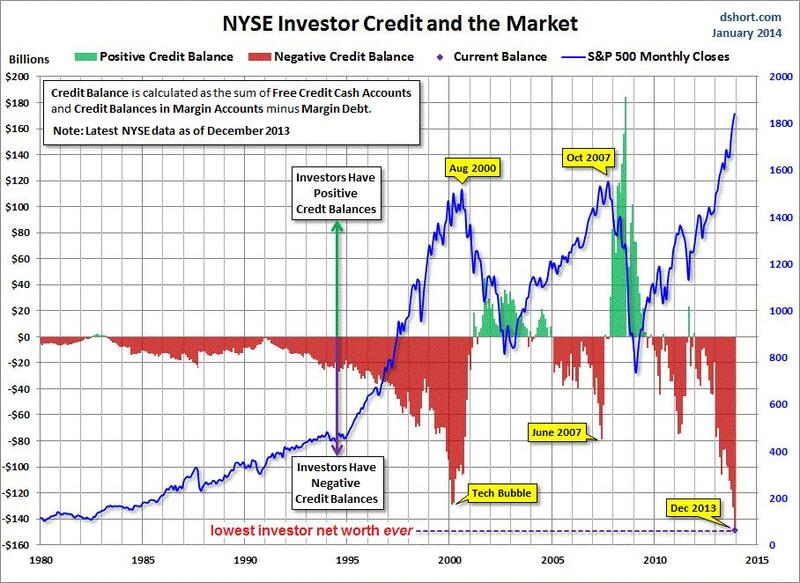 NYSE credit balances are deeply negative and investor ‘net worth’ is thus at its lowest level ever. Fuel for a bull market certainly existed in late 2002/early 2003 and again in late 2008/early 2009, but by now margin debt has expanded to truly vertiginous heights. Not even the tech mania of 2000 can any longer hold a candle to this. Kenaikan tahun 2014 nampaknya mulai goyah setelah belakangan terjadi peningkatan volatilitas dan juga gerak whipsaw. “Should we beware the Ides of March? So warned the soothsayer to Julius Caesar in 44 BC. He should have taken note because, according to Shakespeare, he was assassinated on that very date (which falls tomorrow this year). That soothsayer could make a lot of money if he were around today and appeared on CNBC. All the other stock market pundits would quickly be out of a job. As a soothsayer of the markets, I don’t have that 100% track record. But before I left for my break, I did make a case that stocks would very likely make highs in the month of March. My basic premise was this: From the 2007 highs, I can count a clear five-wave impulsive wave pattern down to the March 2009 low at the 6,500 level. That date is highly significant. I can make two projections from this low. First, the next major move would be an upward corrective move. Second, this move would likely be in an A-B-C form. It has taken five years – almost to the day – to produce this picture of a textbook A-B-C relief rally pattern. My question is: Why has it taken so very long to stretch out this relief rally? For bears such as myself, it was been an agonizing time, although there have been some terrific shorting opportunities along the way. The decline off the 2007 top took around eighteen months. The relief rally has taken sixty months (so far) – over three times as long as the decline. To me, the reason is encapsulated in only one factor – QE. This mammoth increase in funds available for stock speculation started from the depths of the credit crunch. And it has encouraged financial institutions to jump on the stock market bandwagon in an effort to repair the damage done to their firms by the credit implosion. And as markets recovered, sentiment has followed to the point now where we are seeing bubble-like behaviour in many sectors. But what is fascinating to me in the above chart is that the major low of the relief rally (my B wave low) occurred precisely thirty months from the March 2009 low. Project forward thirty months from March 2009 and we come to March 2014 – this month. This is an example of the use of cycles. The study of cycles is a well-researched area in the past. If you analyze historic charts, you will quickly find many examples of patterns being repeated in a cyclic manner. At one time, the four-year stock market cycle was a popular topic. 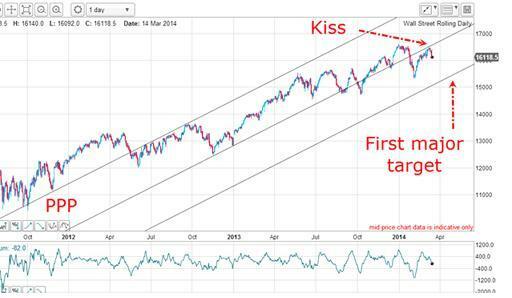 This pattern coincided with major tops and bottoms four years apart. Lately, virtually no-one is talking about cycles – and that’s because the consensus believes stocks are on an ever-upward path. To me, that is a clear warning sign that cycles are quietly operating under the radar – and my new discovery may indeed be one in operation right now. The key point about cycles is that they only work when very few analysts notice them. When a particular cycle is splashed around in the media, it is best to reject it as a basis for forecasting. One way to keep track of the popularity of cycles is to scan the new book releases. If there are a few on cycles, then your time is well spent in searching for them! So if I am looking for a major stock market top this month, is there more evidence that another index can tell me? 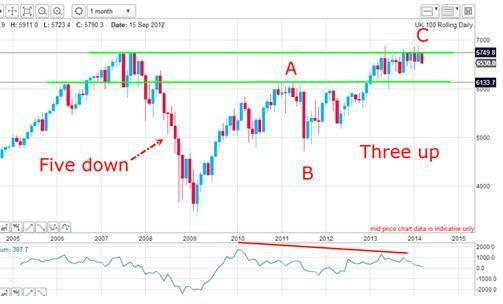 Here is the monthly FTSE chart. 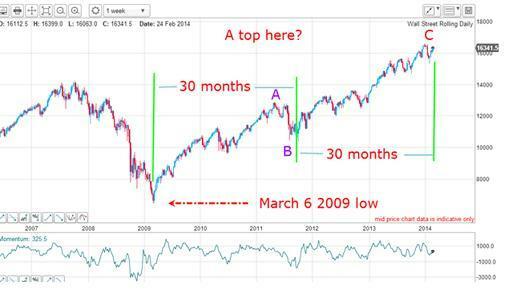 Often, the monthly chart can reveal clues that shorter-term charts miss. Just as in the Dow, there is a well-defined five-wave impulsive pattern off the 2007 highs to the March 2009 low, and the relief rally is in a clear A-B-C. The 2007 highs were in the 6,800 area, and in the last few months the market has rallied to this region. But note that every time it has poked above the 6,800 parapet, it has been shot back down into the trenches. The pigtails of the past few months give the game away. This means the market considers the 6,800 level as very strong resistance. Also, the lower line represents support because I have drawn it across two major tops. The market is currently trading inside the zone between the support and resistance levels. Once it breaks free, the moves should be dramatic. Note the important momentum readings – the maximum for the rally occurred in early 2010 – over four years ago! And since then, the rally has been sustained on a steadily weakening buying power. That is one powerful demonstration of the declining effect of QE. As the added QE liquidity since inception has had a gradually declining supportive effect on the GDP of the USA, so it has on the stock market. Also in the mix is the Fed’s current tapering policy, thereby reducing even further the stimulus effect. Are there any shorter-term clues as to immediate direction? Here is a tramline trio that I am working on the daily Dow. The upper line has a terrific PPP (prior pivot points) from October 2011 and clips the important highs in late 2012. Also, there was an important high on 22 May 2012. If you were reading my emails at the time, you will recall that I identified that top and an excellent short trade resulted. But in the past few days, the market has made a kiss on the underside of my centre tramline and is backing off it very sharply in textbook scalded cat fashion. This action supports my contention that we have indeed seen a major top already this month and the path of least resistance is now down. “It is incorrect to believe that the 2008-2009 market plunge and financial crisis were caused by the housing bubble. The housing bubble was merely the expression of a very specific underlying dynamic. The true cause of that episode can be found earlier, in Federal Reserve policies that suppressed short-term interest rates following the 2000-2002 recession, and provoked a multi-year speculative “reach for yield” into mortgage securities. Wall Street was quite happy to supply the desired “product” to investors who – observing that the housing market had never experienced major losses – misinvested trillions of dollars of savings, chasing mortgage securities and financing a speculative bubble. Of course, the only way to generate enough “product” was to make mortgage loans of progressively lower quality to anyone with a pulse. To believe that the housing bubble caused the crash was is to ignore its origin in Federal Reserve policies that forced investors to reach for yield. Tragically, the Federal Reserve has done the same thing again – starving investors of safe returns, and promoting a reach for yield into increasingly elevated and speculative assets. Thinking about the crisis only from the perspective of housing, investors and policy-makers have allowed the same process to play out more broadly in the equity market. On a quantitative basis, the overvaluation of the equity market is greater percentage-wise, and greater dollar-wise, than the overvaluation of housing in 2006-2007. We fully expect that from present valuations, U.S. stocks will produce zero or negative returns on every horizon shorter than 7 years. There is no antidote or alchemy that will allow a buy-and-hold approach to squeeze water from this stone. There is no painless monetary fix that will shift the allocation of capital toward productive investment and away from distortive speculation.